If you’re heading into your golden years, it’s no surprise that you’re scouting for gated communities in Central Florida. 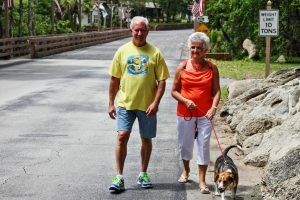 After all, you may or may not be thinking of retiring, but you still have plenty of energy and a desire to stay active in a beautiful Florida setting that offers plenty to see and do on a daily basis. You’re no doubt looking for more than just privacy and security in the gated communities you plan to visit. So we invite you to Bear Creek, a gated community for active adults 55 and older, to see why it’s the best choice to help you enjoy resort-style living without depleting your savings. Located in a woodsy nook of Ormond Beach, just north of Daytona Beach, Bear Creek offers high-quality manufactured homes and an abundance of amenities that you’ll be hard-pressed to find at other Central FL gated communities. From scenic nature trails to our three spacious clubhouses and pools, Bear Creek is hard to beat when it comes to offering a nearly inexhaustible assortment of activities that foster friendships and encourage physical activity. Included in the low monthly home site lease payment is unlimited access to amenities such as lighted tennis and pickleball courts, a fitness center, and plenty of spaces to accommodate get-togethers large and small. In addition, only an hour away by car, you’ll find theme parks, sports venues, and plenty of other popular attractions in nearby Orlando. But the best way to evaluate the gated communities you’re considering in Central Florida is to visit them in person. Contact us today to schedule a tour of beautiful Bear Creek.